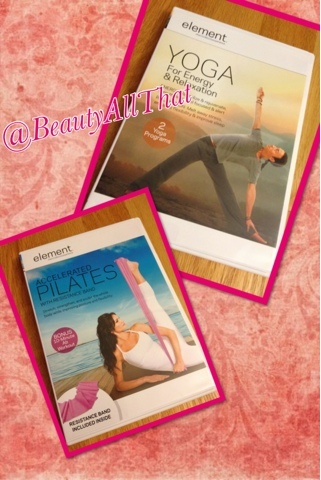 A few weeks ago, two brand new Element DVDs launched and my fitness-self couldn't be more ecstatic! I have been using the Element (the Yoga AM/PM) DVD all summer and I fell in love with the easy, calming yoga routines from the DVD as I incorporated them into my daily workouts. The two new Element DVDs are Yoga for Energy & Relaxation -perfect for weekdays and weekends - and Accelerated Pilates with resistance band. First, Energy & Relaxation offers a 30 minute energized routine to give your body a boost. I felt more awake and after most workouts, in tune with my body and focused. The 40 minute Relaxation program was enjoyable with moves that worked on my flexibility. The Accelerated Pilates DVD is a real gem! It includes a resistance band- needed one after mine broke- and a 30 minute routine. Amazingly sweat levels minimal but try this routine twice and you'll get a real challenge. Small movements using the band really makes a difference and I am loving it. If you're looking to change your routine and want some strengthening moves, this is a must try.